In 2013, Dave completed the Llangollen to Prestatyn Change Step Triathlon which involved a 55 mile trek on foot and on cycle. Dave, 6 other staff members and a Barclays Bank, Llandudno representative managed to raise approx. £4000 for our charity. In May this year, Dave competed in the Chester half marathon. He spent two months in training and was pleased that he didn’t ‘hit the wall’ until mile 11. 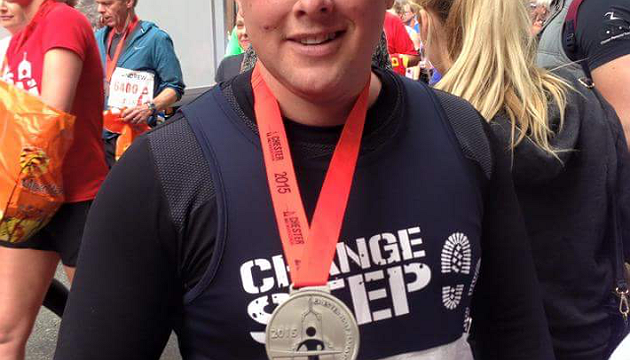 He finished the marathon in great time and managed to raise £236 in the process. Dave is committed to fundraising for Change Step and Listen In as he wants to help ensure that the charity will continue to help veterans and their families year on year. The big hope is that one day, he will get to climb Kilimanjaro and place a Change Step flag on the top. Good luck Dave, we are all supporting you.